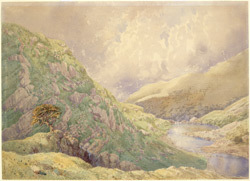 Water-colour painting of a hilly scene with a river valley in the Nilgiri Hills by Sir Richard Hieram Sankey (1829-1908), c.1850. Situated in Tamil Nadu in the south of India, the Nilgiris (nila meaning blue and giri meaning mountain) soar to a height of over 2,500 metres. Due to the low latitude and high altitude of the hills the climate in this region is very pleasant. The scenery, comprising of rolling hills, waterfalls, green ferns and patches of woodland is also very beautiful. Traditionally the area was home to the Toda people however in the 19th century it became a popular retreat for European people escaping the heat of Madras.